For Geeta Ramcharitar, the ordeal began with a past due balance of $4.70 owed to her condominium association in Melbourne’s Venetian Village — and ballooned from there. The threatened end: foreclosure on her two-bedroom condo. The 56-year-old grandmother got lucky. County Court Judge William McLuan tossed out the foreclosure case brought by her condo association, ordering each side to pay their own attorney’s fees. But while Ramcharitar’s situation sounds extreme — a foreclosure case that began over what initially was such a paltry sum — she’s hardly alone. Condominium associations, as well as homeowner’s associations, always have had the right to move for foreclosure for nonpayment of dues. And with condo and homeowner’s associations under greater financial pressure because of the poor economy, many are moving more aggressively to recover money owed them, experts say, even as foreclosure remains a last resort. “The old rules of engagements have changed,” said Donna Berger of Katzman, Garfinkel & Berger in Fort Lauderdale, who was not involved in Ramcharitar’s case. Geeta Ramcharitar holds her 5-month-old grandson, Andrew, in her Venetian Village condo in Melbourne. 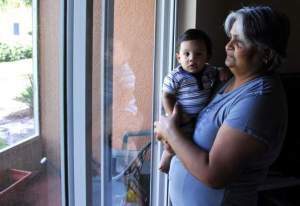 She had faced foreclosure after she missed paying a small fee and her overdue balance ballooned. A judge threw out the case. Officials at the Venetian Village said they do work with delinquent homeowners to come up with payment plans and that efforts were made with Ramcharitar. They declined, however, to give the details of her case. Marlene Kirtland, the attorney representing Becker & Poliakoff, the law firm representing the condo association, also declined to comment. The exact origins of Ramcharitar’s dispute are unclear, but records show she owed a past due balance of $4.70 to the association in August 2009 and became subject to monthly late fees. By November of that year, certified letters sent by Becker & Poliakoff said the association intended to foreclose for nonpayment of dues. At the time, her total outstanding fees were $1,248.89. Of that total, $760 were for attorney fees. By the middle of 2010, the attorney fees for all the paperwork sent to her had ballooned to about $3,000. An effort at mediation failed. That led to a non- jury foreclosure trial this summer. “This was completely unnecessary,” said Ramcharitar’s lawyer, Ken Weaver, who disputed the charges against her. Evan McKenzie, a professor at the University of Illinois at Chicago, who researches homeowner and condominium associations, said after the 2008 recession, homeowner’s associations found themselves in a financially difficult position. Weaver said he’s grateful the case was tossed out, and complained that the practice that started the problem is predatory.